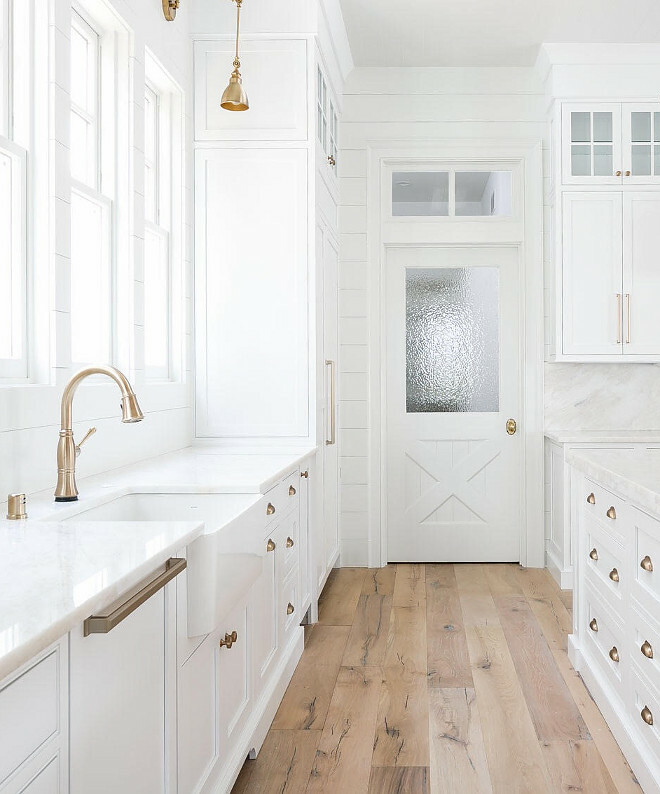 I am very happy to switch things up in today’s post and share mostly farmhouse interiors. There’s plenty of rustic interiors, plenty of farmhouse interiors and since summer is our next season (can you believe it?) you will also find many farmhouse bunk room pictures and ideas so you can start planning a bunk room in your own home or cottage! Wouldn’t that be fun?! 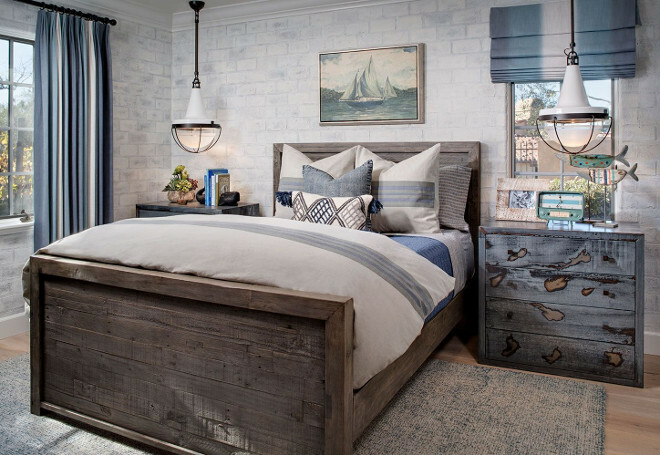 Get inspired by these modern farmhouse, coastal farmhouse and rustic modern farmhouse interiors. 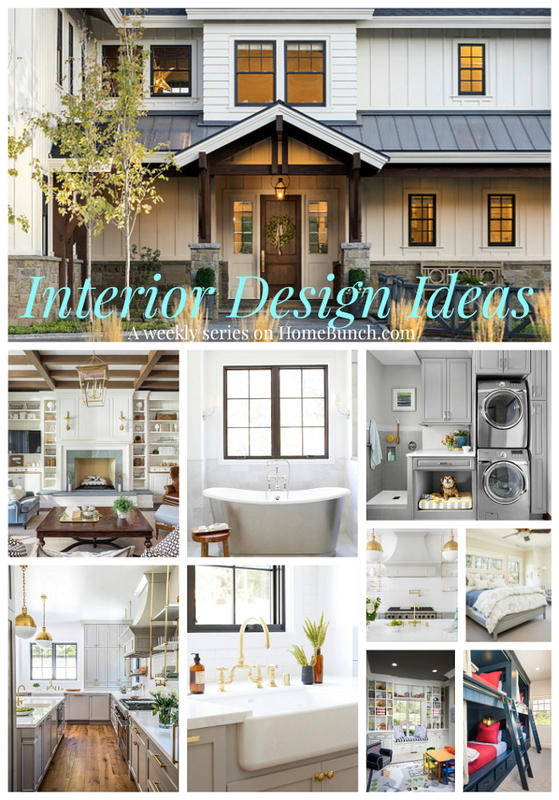 There’s an inspiring idea for every room in the house. 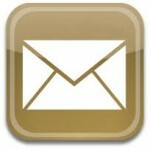 Pin, save and have a great time! 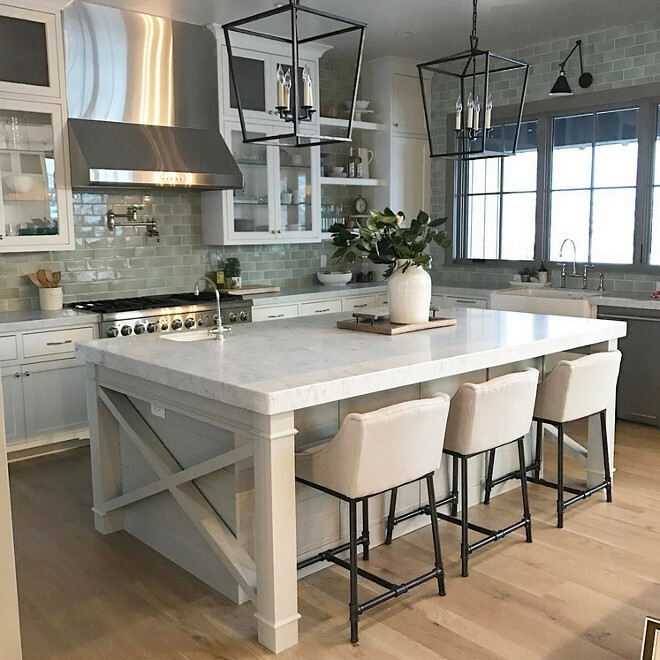 Gorgeous farmhouse kitchen island with x side and shiplap and thick marble countertop. The backsplash tile if from Daltile. 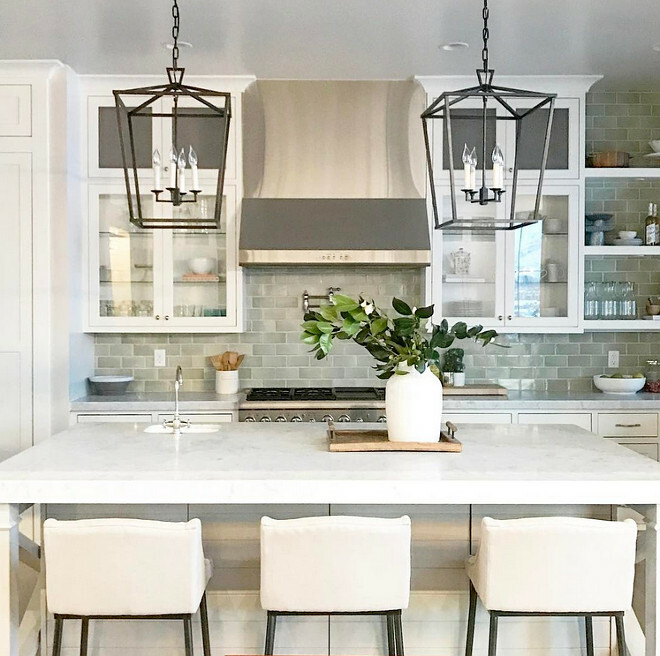 Caitlin Creer Interiors – Instagram. Lighting is Visual Comfort CHC2165AI E.F. Chapman Darlana 4 Light 17 inch Aged Iron with Wax. 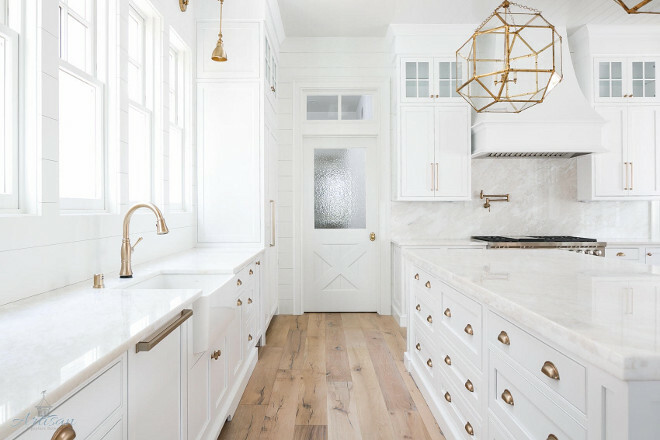 This white kitchen combines classic elements like the white marble countertop and backsplash with farmhouse trends such as shiplap paneling, tongue and groove ceiling, a cross hatch pantry door and white oak floors. 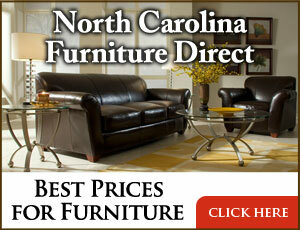 Floors are European French white oak with a white stain and water based finish. The cross hatch door was custom made by a local wood shop. Countertop is Barcello Cream Marble and backsplash behind Wolf stove is a full slab of Barcello Cream. 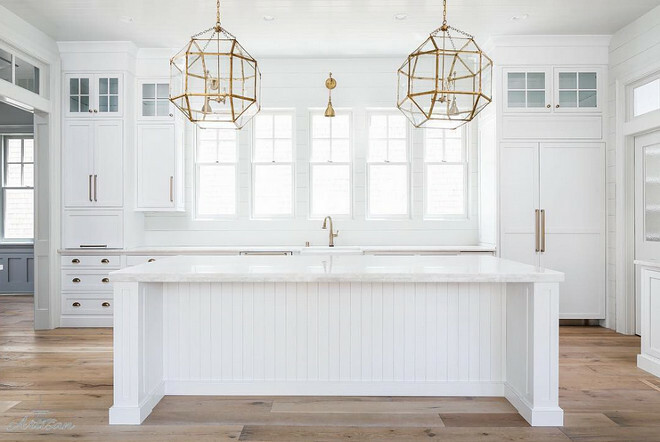 The brass island lights are Suzanne Kasler Morris Lantern in Gilded Iron from @Lulubellesboutique. 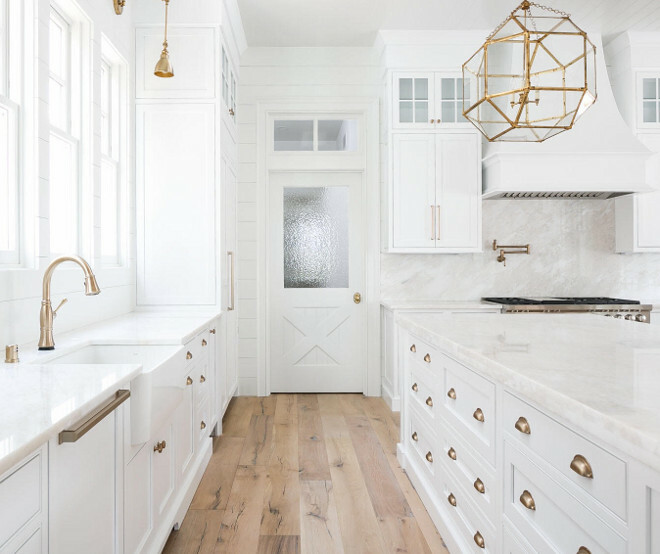 Brass arm lights over the sink are from Savoy House. 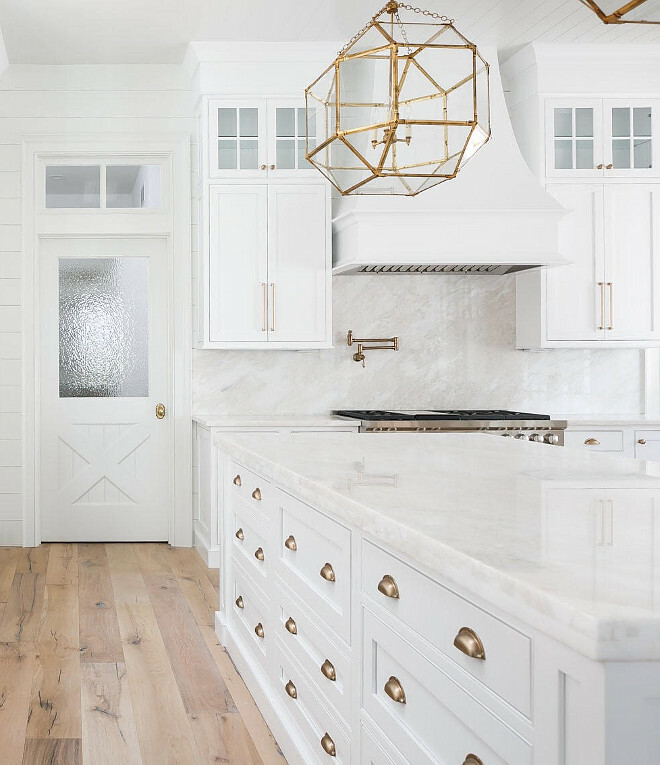 The brass cabinet hardware is Atlas and the finish is Champagne. The brass kitchen faucet is by Delta. 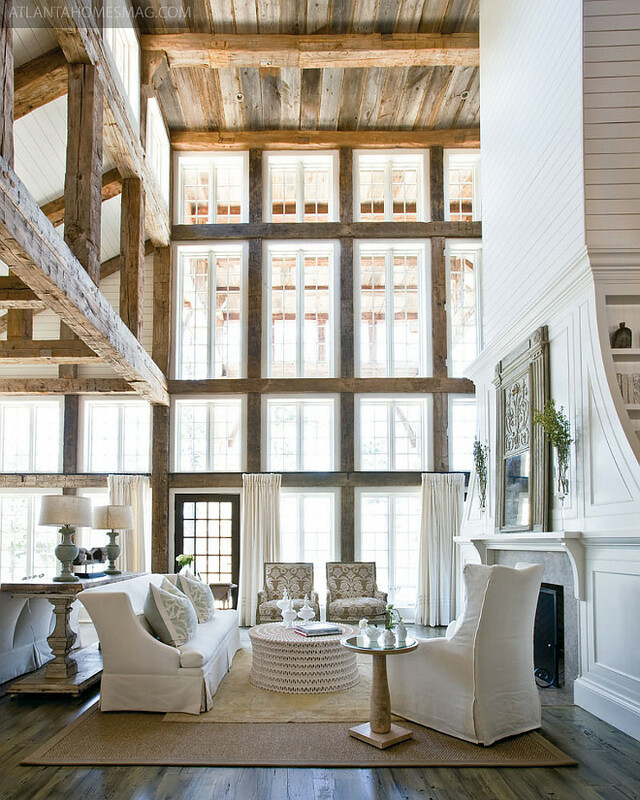 Living room with tall ceilings, rustic barnwood plank, exposed rustic beams, reclaimed wood trim and shiplap fireplace paneling. Design by Paige Sumblin Schnell from Tracery Interiors via Atlanta Homes & Lifestyles. 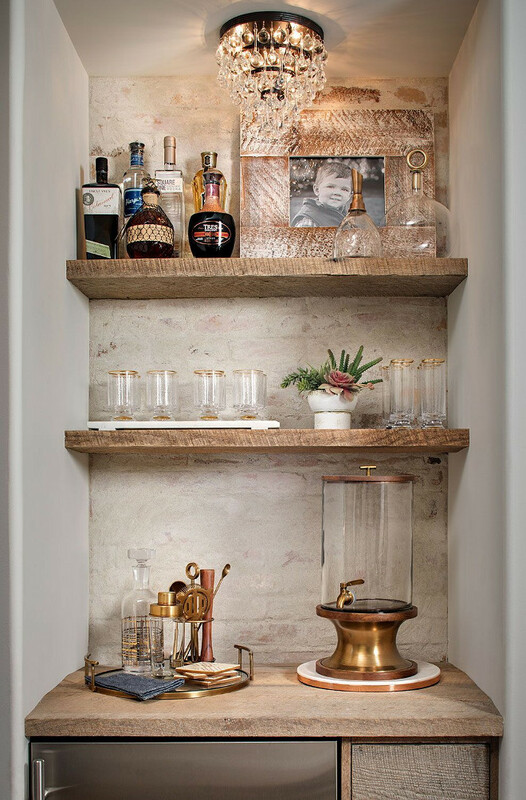 Farmhouse wet bar with white brick wall and reclaimed wood shelves. 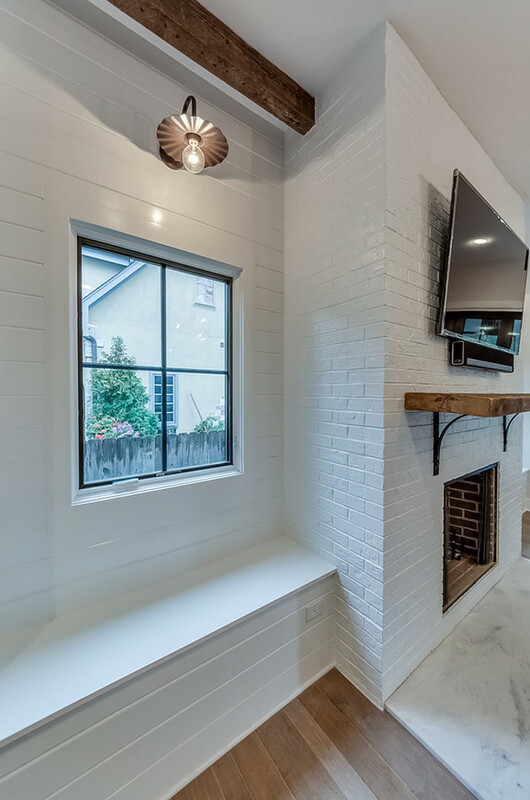 The accent ​brick wall features a whitewash over the brick and it’s done with grout washing not paint. 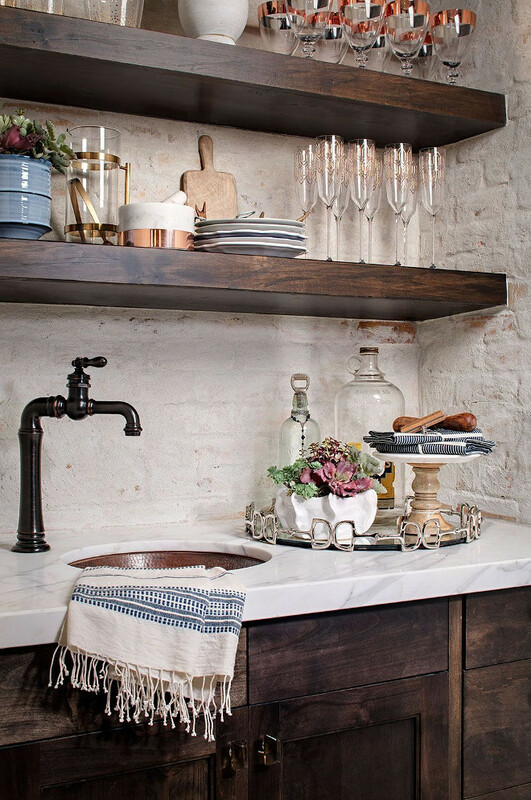 Farmhouse butler’s pantry with dark cabinets, white marble countertop and painted brick backsplash. Napa farmhouse with a modern plaster fireplace. 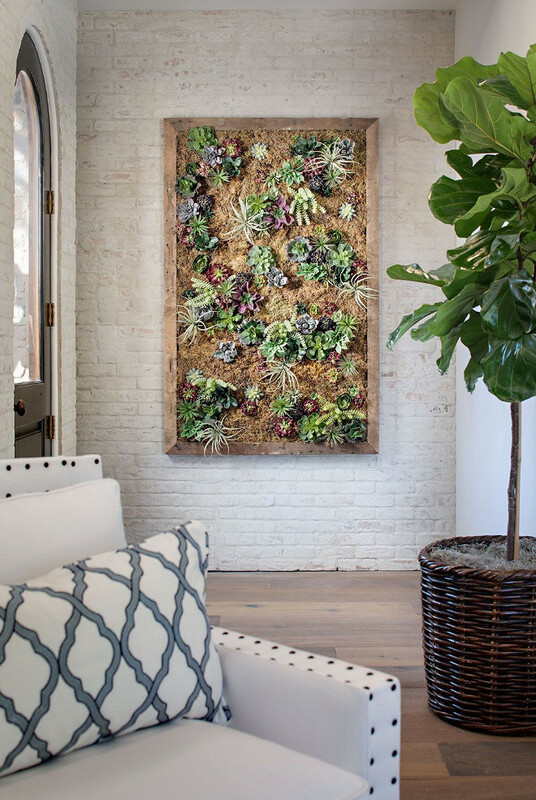 Farmhouse entry with succulent ​wall art and whitewashed brick walls. Farmhouse living room with white brick fireplace, reclaimed wood shelf with wrought iron brackets used as mantel and shilplap window-seats flanking the farmhouse-style fireplace. 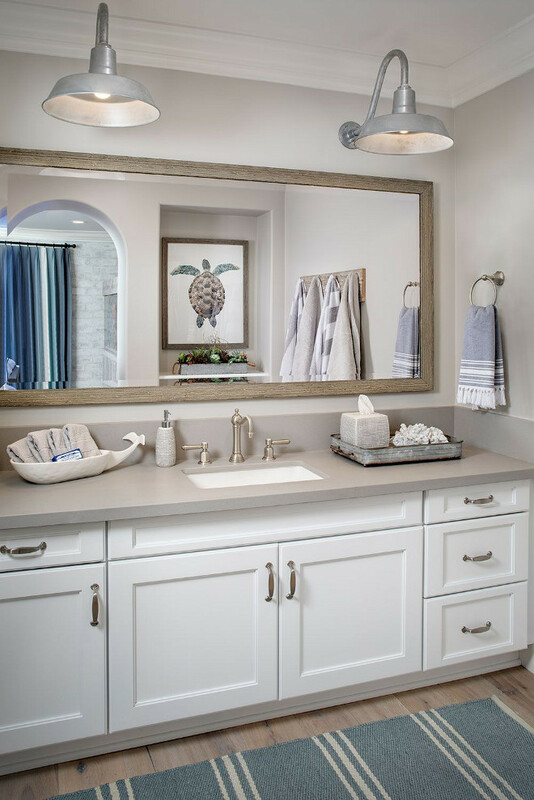 Farmhouse bathroom with quartz countertop; Raw Concrete Quartz from Ceasarstone, and barn lighting. 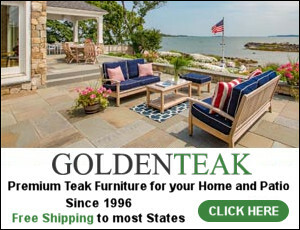 Lights: The Original Warehouse Gooseneck Light from Barn Light Electric​ Co​. 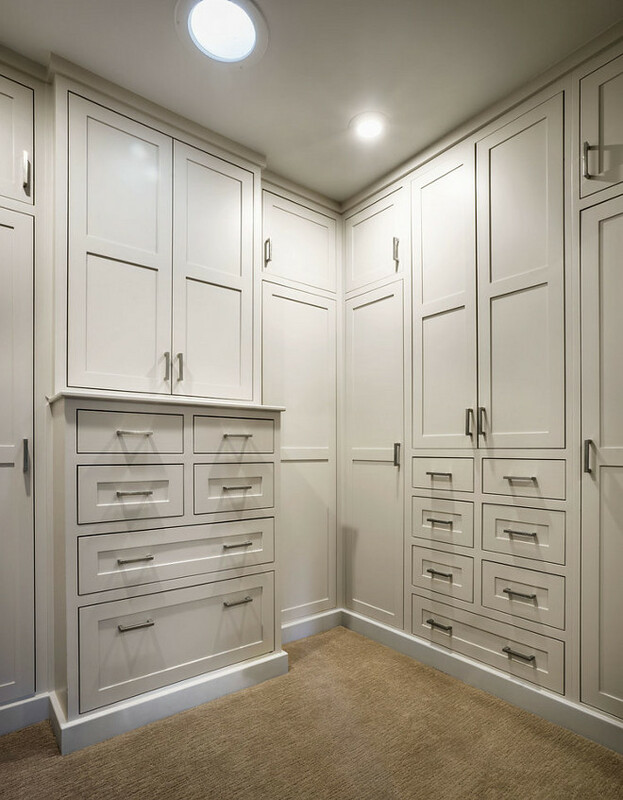 Cabinets are in Sherwin Williams Agreeable Gray SW 7029 and the hardware is Rocky Mountain Hardware, 9″ Rail Pull CK261 in White Bronze, brushed. Photo by Blackstone Edge Studios. 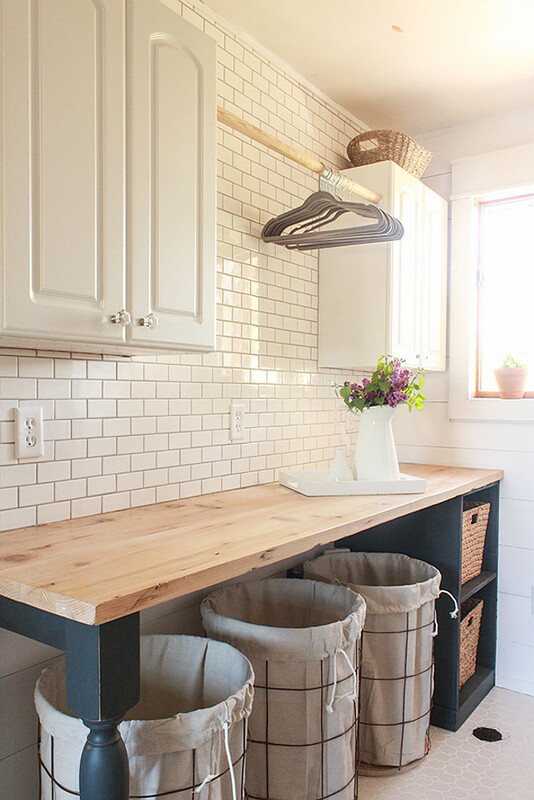 Gorgeous farmhouse laundry room with diy folding table with butler’s block countertop, diy shiplap walls and white subway tile backsplash. 5 Benjamin Moore Gray Colors: Benjamin Moore OC-52 Gray Owl. Benjamin Moore AF-100 Pashima. Benjamin Moore HC-172 Revere Pweter. Benjamin Moore HC-170 Stonington Gray. 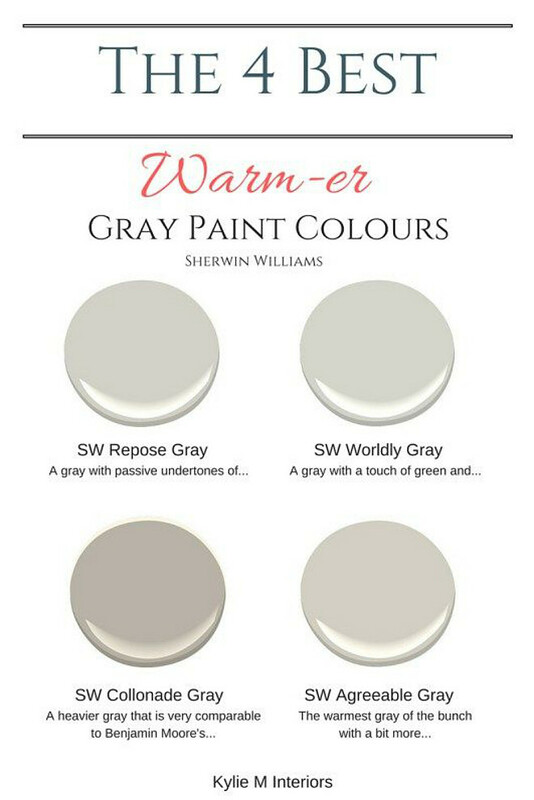 Warm Grey Paint Colors: Sherwin Williams Respose Gray. Sherwin Williams Worldly Gray. Sherwin Williams Collonade Gray. Sherwin Williams Aggreable Gray. 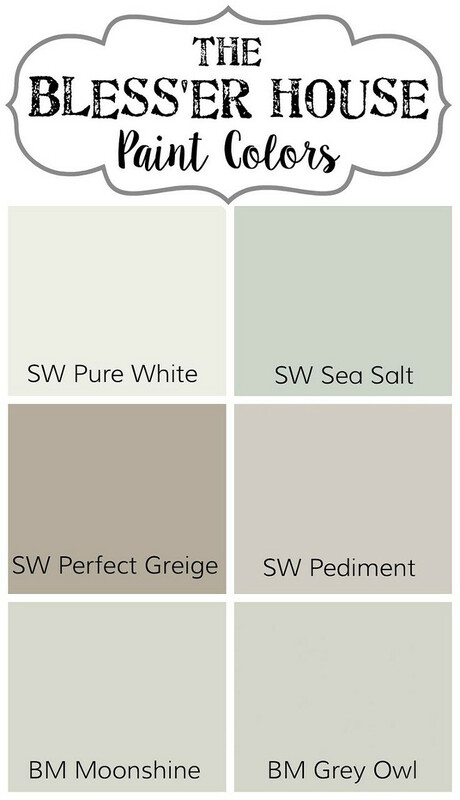 Soothing Paint Colors: Sherwin Williams Pure White. Sherwin Williams Sea Salt. Sherwin Williams Perfect Greige. Sherwin Williams Pediment. Benjamin Moore Moonshine. Benjamin Moore Grey Owl. 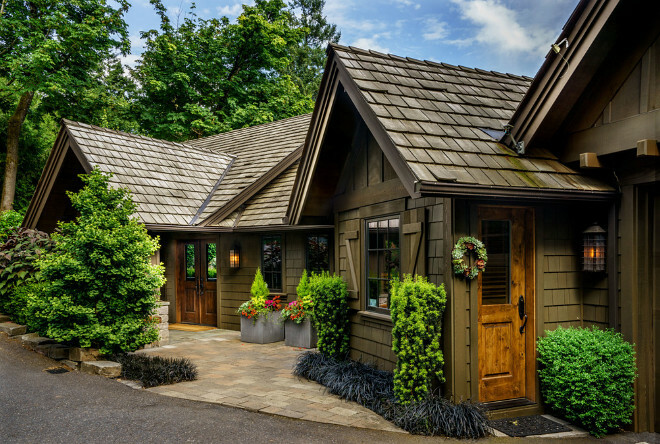 Charming cedar shingle cottage with charming landscaping. 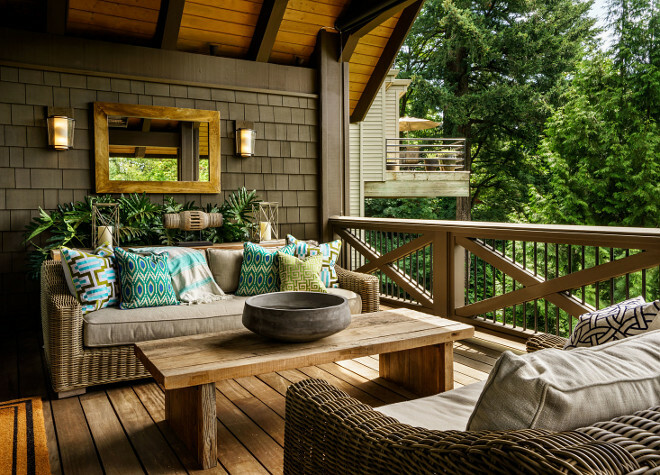 Inspiring porch furniture and decor. 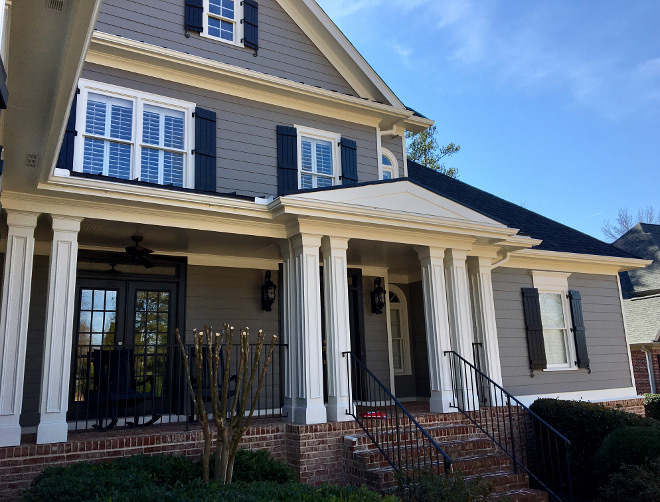 Grey Exterior Color Scheme: Siding Paint Color: Benjamin Moore 1475 Graystone. Trim Paint Color: Benjamin Moore OC-17 White Dove. 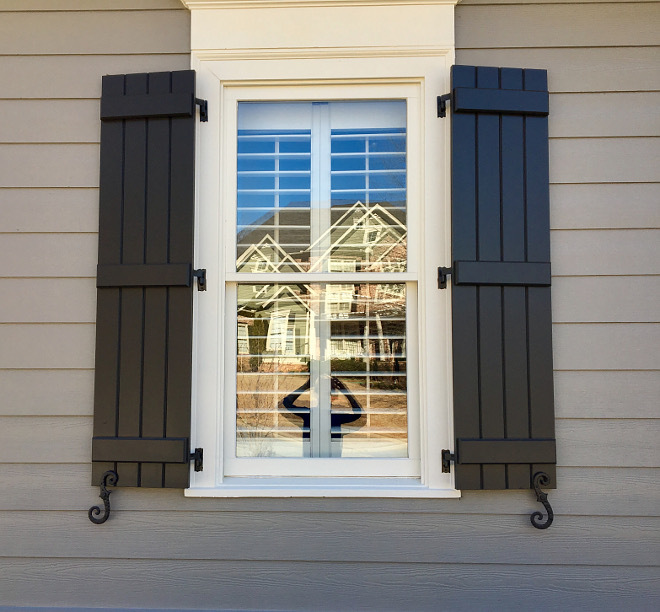 Shutters Paint Color: Benjamin Moore CW-680 Mopboard Black. Design by Rebecca Dumas from It All Starts with Color blog. Black Shutter Paint Color: Benjamin Moore Mopboard Black. 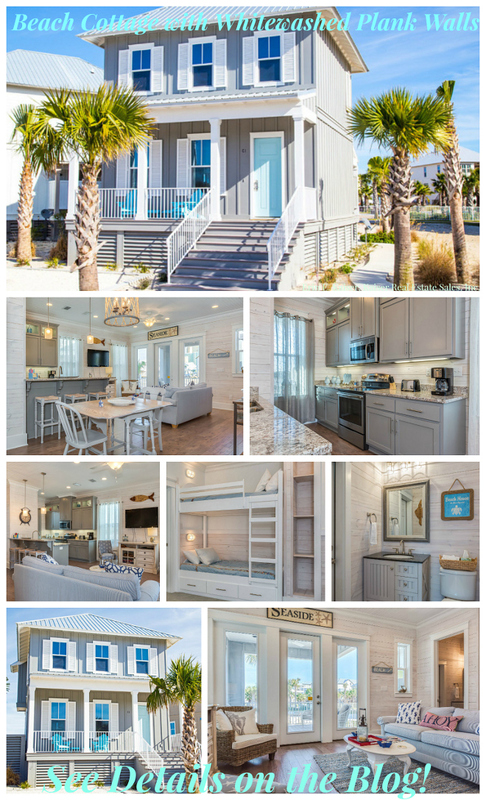 Tuesday: Beach Cottage with Whitewashed Plank Walls. Wednesday: Gorgeous Home with Quarter Sawn White Oak Kitchen. Wasn’t it fun to see all of these beautiful spaces? I hope you had a great time, could relax and feel inspired.